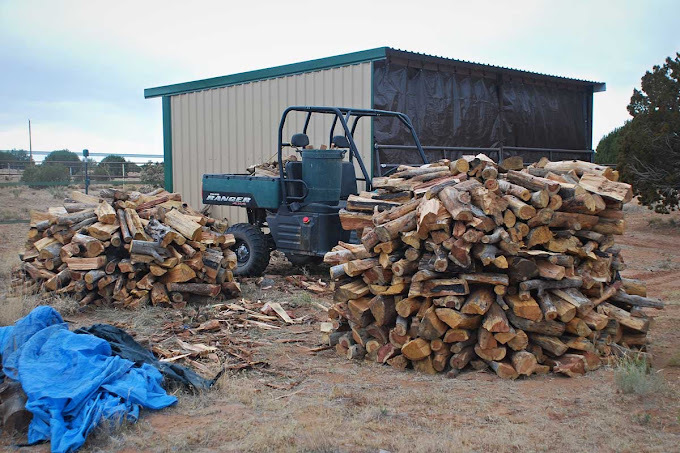 The 7MSN Ranch: There's a science to wood stacking...who knew? There's a science to wood stacking...who knew? The Firewood Delivery Man (also known as my imaginary serial killer) dumped off two cords of firewood in late September. God bless him. That was one less thing for me to do, and it turned out he wasn't a serial killer after all. How lucky can a girl get? Anyway, the wood has sat in a great big pile out by the hay barn since then, minding its own business. I have not been compelled to stack it because: a) I'm not lacking for space so it can take up as much room as it wants, b) nobody but me will ever see the pile and deem me a lazy slacker, so c) what's the point? Then a porcupine came into my life and I started wondering about where he might live. He wouldn't jump out of the pile one day when I unsuspectingly went to fetch a load. Or wood he? 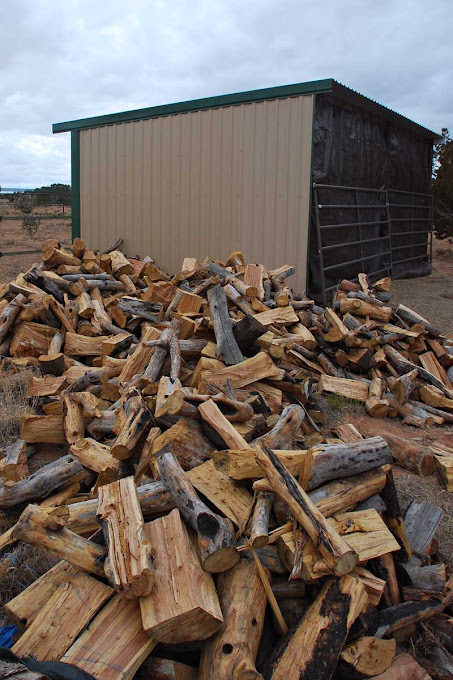 Erring on the side of caution, I decided it would be a good idea to stack the wood, the better to see any porcupines, packrats or other perpetrators living within. With my decision made, I proceeded to procrastinate because stacking wood was not on my top 10 list of things I wanted to do Sunday afternoon. 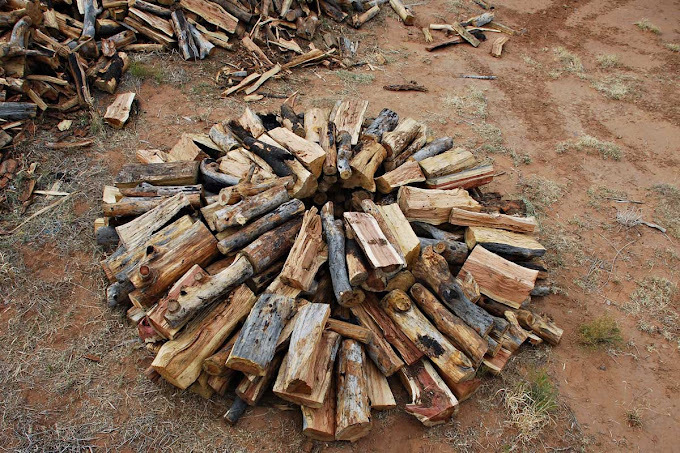 I turned to my favorite procrastination device, the internet, to see if there was a right way or a wrong way to stack firewood. Wouldn't you know it? 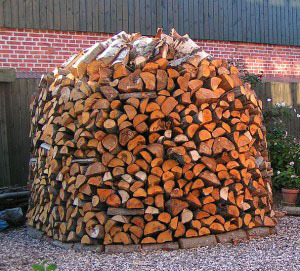 There is a Science of Wood Stacking. I so did not need to know that. "Firewood dumped in a heap won't dry and it won't burn well blah blah blah rain will soak into the cut ends blah blah blah ground moisture will soak into the inner bark." Alright! Alright! I'll stack it! But then I read about the Shaker round woodpile. "It will keep your wood dry and dazzle the neighbors." Won't those cows be impressed, I thought. And maybe this could be kind of fun. Silly me thought it might be fun to stack two cords of wood into a pretty, even, symmetrical cylinder. Silly me needs to have her head examined. Three hours later, I had one and a half not-so-pretty, lopsided, asymmetrical cylinders of wood. But at least I no longer have a prodigious porcupine proving ground. of the 2012 7MSN Ranch calendar. Click here to review your choices and cast your vote. 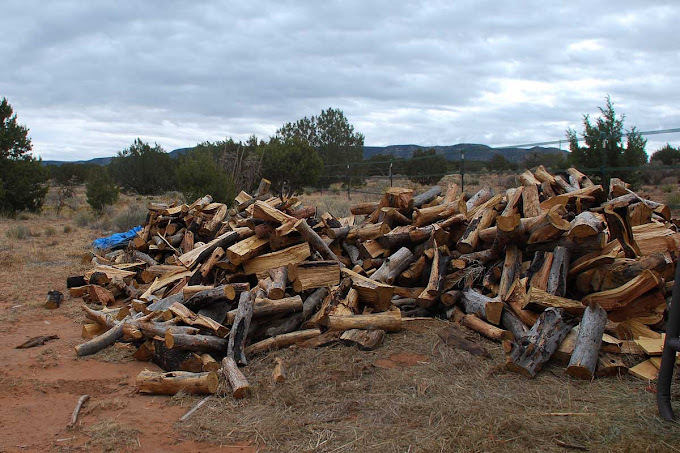 I never minded stacking the wood when we had a woodstove, but it seemed the piles when down (were used up) a whole lot faster then what it took me to make them! Good try though. I never knew stacking wood could be such an "art". I imagine the Shakers had a lot of people standing around each side of their round woodpiles, adding logs in turn . . . don't you? Our good ol' farm kid who was going to stack our wood didn't show up when he was supposed to. I might have to start stackin'. I wonder if the porcupine thinks "She's inviting me to stay, she built not one but TWO wooden igloos for me to choose from!"? The middle hole looks like a perfect hideout to me! Gosh and all this time we just were working with our little wall. We have enough wood for 45 Texas winters. I really need to get rid of some! I'm thinking that the porcupine will move into one of those nice, cozy, warm woodpiles! Good pile considering that the Shaker photo has nice even wood, not all gnarly and curved like yours. Yesterday was a wood cutting/splitting/stacking day for us too. Keep going Carson, your wood pile is taking shape. Those Shakers knew lots about wood anyway. Yes a porcupine might just want to stay the winter since it's cozy at your place. Count your blessings as my good friend in Texas is battling wild pigs on her ranch. They digging holes and destroying the land.They are big and mean. Wow! 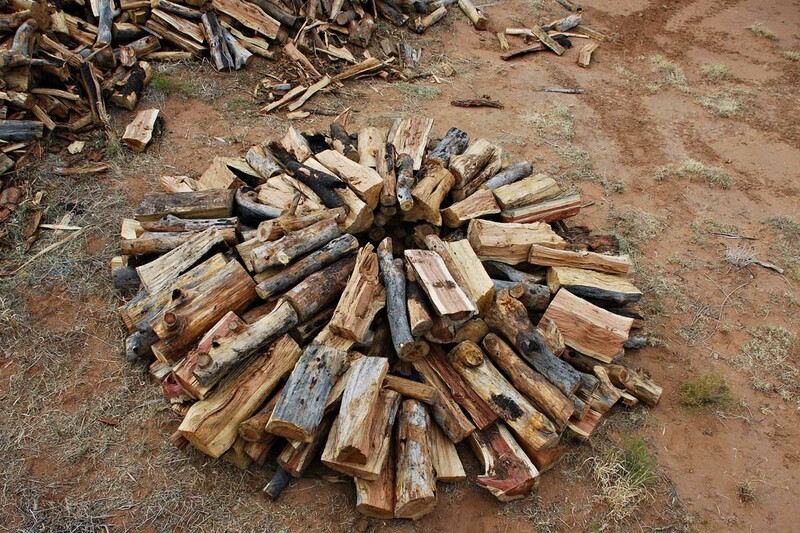 What a cool looking pile of stacked wood. Who would think? Your piles are pretty darn good for your first shot! Keep practicing! I HATE stacking wood. There is definitely a technique to doing it, and I think you have to have a talent for it (I do NOT). As we use wood for heat in the rainy/cold PNW, it's a yearly venture. I look for anything else I can do to avoid stacking (including using the "procrastination device) :) I'm impressed... "I" think you did an excellent job!!! I love stacking wood. I get it from several sources so it's all sizes and shapes, and it's hard to stack properly. I had several trees trimmed this spring, which left a lot of scattered wood on the property. So I hired a fellow to gather it up and stack it for me in the woodshed. He obviously didn't read about it on the internet. The rows are 10 feet high and are leaning. It looks like a Jenga puzzle, ready to collapse the first time I pry a stick from it. Do porcupines crave salt? Do you have a salt lick it can get to? Perhaps that's what has attracted it. Maybe there's a salt lick for the cows somewhere close. Anyway, if that's what it's after, it might get its fill and amble back to where it really lives. I like #8, with George and Alan and the flowers. Too cute. You are way more ambitious than I am!! Wow. okay, you did a hell of a better job than I EVER would be able to do with the stacking..... but I laughed my head off with this post... thanks for sharing your adventures.... and seriously, whoever stacked that wood in the "demo" photograph....obviously does nothing else at all! Awe! What a cute little place for you 'Porcupine'! LOL Love the art of the round stack! Never knew! Ok, Linda, where are you? No post today (Tuesday)? Hope you are OK. You know I set my clock by your morning post. Do I have to call the Sherikf? Love the wood stack, and would like to try it next fall. Wood Workout sounds good to me.